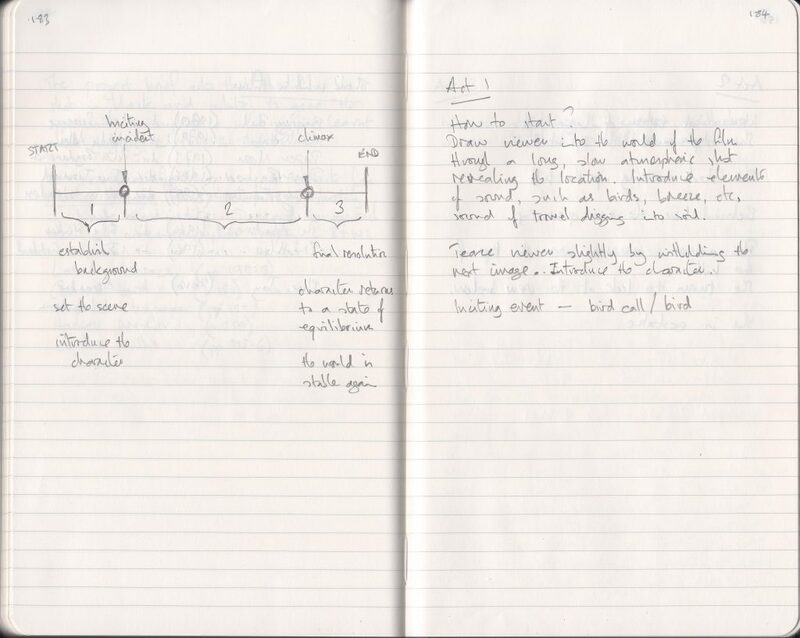 Brief: Make a short film of a story about the longing for freedom. Edit two versions of this film: one short using only the essential information and one longer. A woman is weeding the flower bed in her garden. She hears birdsong. Looking to see where the sound came from, she sees small bird perched on a chair. The bird flies away and the woman looks up, trying to follow it. The woman arrives at the bottom of a large hill. She walks up the hill, eventually emerging over the top of the hill with the landscape behind her. She turns to look at the landscape. The woman is standing in her garden, on a chair, looking over the fences and into other gardens, her arms spread out like wings. Her husband sees her and reacts. Cutting to a different scene/location. Character enters an empty frame. Use of cutaways to another subject. How long do you think this sequence will last on screen? What will be the consequence of cutting each shot/scene very short or alternatively longer? When planning this project film I knew I would be capturing several shots, many of which would be quite long in duration. As the script was over a page long, I expected this sequence would last between one and two minutes on screen. I used a range of conventions when editing the long version, such as cutting to a different scene/location between the garden and the foot of the hill near the beginning of the film and between the hilltop and the garden at the end of the film. I used shots of the character entering an empty frame and cutaways of birds and trees to indicate the passage of time between scenes. I also added a dissolve between the character’s POV of the landscape and her in the garden to indicate a longer passage of time at the end of the film. The result is a sequence that is quite slow and lasts for almost two minutes. The effect of the short version is quite different. Cutting the shots very short and allowing only the most essential information required to tell the story to appear on screen has resulted in a much quicker sequence. I still used several conventions appropriate to contracting time within a moving image, such as cutting to a different scene/location, the character entering an empty frame and using cutaways to another subject, all to indicate the passage of time within the sequence. I did not add a dissolve between the character’s POV of the landscape and her back in the garden at the end of the film as I did not feel it needed this. Although we still see the story moving from garden to hill and back to garden again, in this version time has contracted even more. Using a much more concise sequence of shots has resulted in a more condensed moving image. 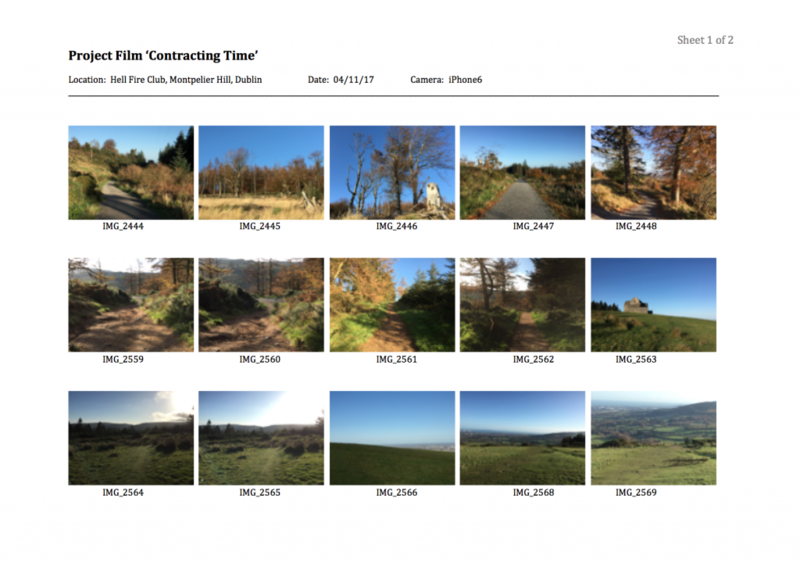 I spent this morning, a sunny autumn Saturday morning, scouting around Montpelier Hill in the Dublin Mountains trying to find suitable locations for the second scene of my project film about ‘contracting time’. I arrived at the location just after 9:00 am and walked around the area for over an hour. The sun was still quite low in the sky, which added a nice quality of light and cast plenty of shadows. Both of which are perfect for shooting in black-and-white. I took a series of photos on my smartphone, following various routes up to and around the summit of the hill. The photos were taken from positions that I felt would best suit the action presented in the script. 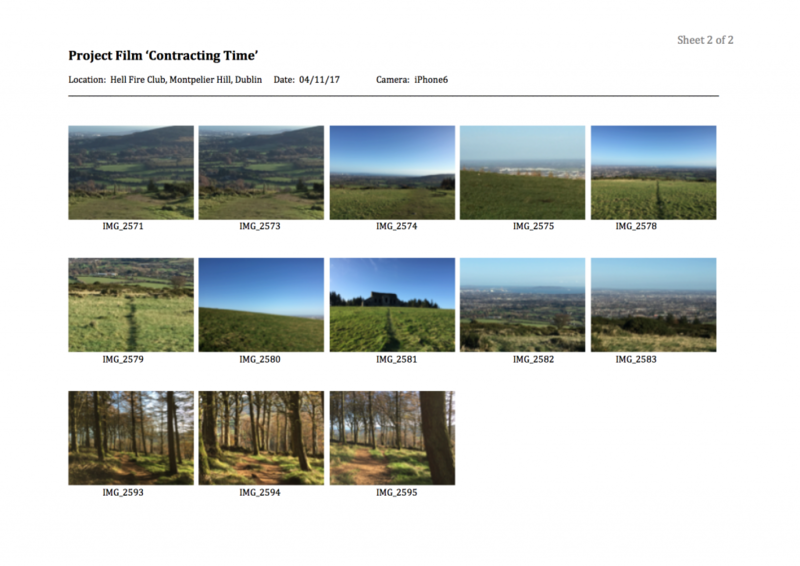 Back at home, I prepared a contact sheet using about two thirds of the photos taken on the hill, editing out the duplicate shots and weak compositions. 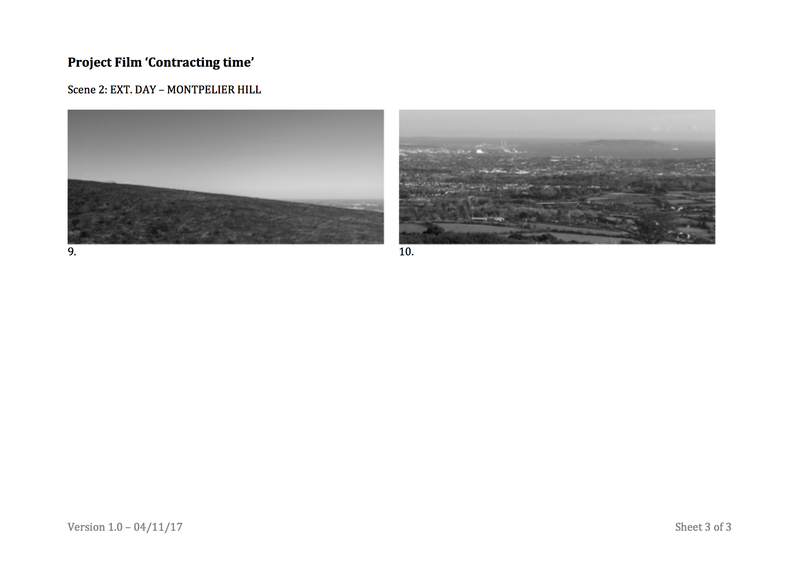 I selected ten images from the contact sheet which I thought would most likely work together in the sequence in which the protagonist is walking up the hill. I chose images which emphasised a strong sense of place and the protagonist’s desire for freedom. Starting in the forest, moving up along the path, out into the open landscape of the hillside, and looking back at the view of Dublin Bay below. 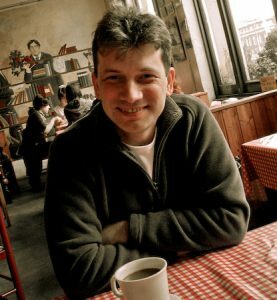 The ten images were imported into Photoshop, cropped down to an aspect ration of 2.35:1 and converted to black-and-white. This helped to give a sense of what the shots might look like if they were filmed in this location. 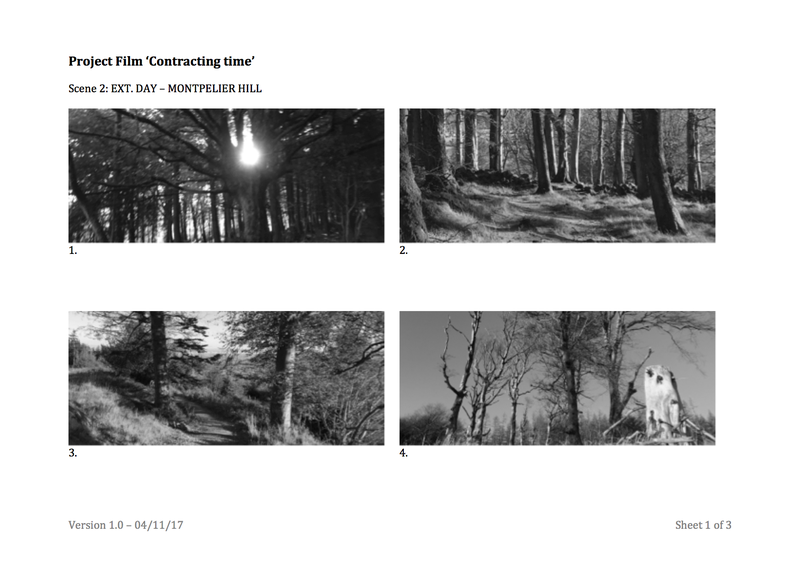 Taking the middle section of the storyline, in which the protagonist is walking up hill, I laid out the black-and-white images in sequence, like a storyboard, to show the scene as it might unfold in the film. I’ve not tried this approach before. But, photographing images on location, selecting the best and laying them out in sequence to illustrate this scene like this was a useful way of testing out framing, shot sizes and storyboard ideas and generally seeing how this particular location might work in practice. However, it’s important to note that the images from the smartphone lens do not match that of the lenses I will be using when filming with the FS7 camera. 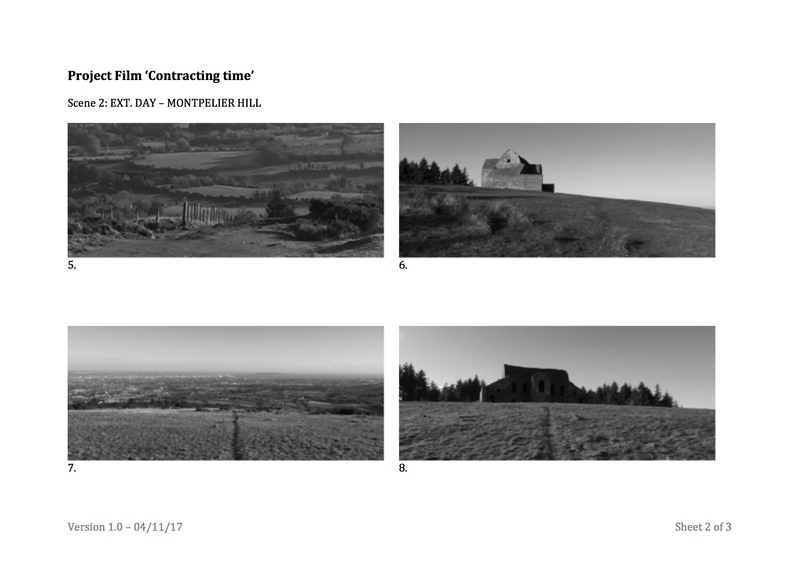 So the sequence of black-and-white images above should be seen as only a rough, but very informative guide to what the final film will look like. The project brief requires the film to be shot in black-and-white, to give ‘the opportunity to emphasize what you’ve learnt about lighting in Part 2 Shot.’ Filming in black-and-white is something I am very keen to try. So I carried out some research into the approaches adopted by several cinematographers. The main issue identified by these cinematographers is the need for creating separation and depth in a black-and-white shot. ‘Black-and-white only concerns itself with the grey scale from white to black. And separation has to do with depth and using these values against one another creates depth. You have to understand that you want to create depth to get reality…You don’t want things to blend into one another. So you have to create separation and depth’ (Schaefer & Salvato, 2013:156). ‘Black-and-white is difficult because you have the grey tonalities from black to white and you have to create an image which includes depth and separation. In color a brown head will separate from a beige wall naturally but in black-and-white they may run together. You must create a lot of simple compositional elements in black-and-white… The lighting creates everything: the tone, images, texture and mood. It is so important that those elements are harmoniously put together in order to serve the visual impact’ (Schaefer & Salvato, 2013:192). ‘When you’re shooting in black-and-white, all you’re dealing with is values so…you do have to separate an actor from a wall. Whereas if you’re in color and you have an actor and a colored wall, then you get automatic separation’ (Schaefer & Salvato, 2013:306). What’s clear from this is the need to create a sense of depth that helps to separate the actor from the background. This can be achieved by creating ‘simple compositional elements’ within the frame that will work in black and white. 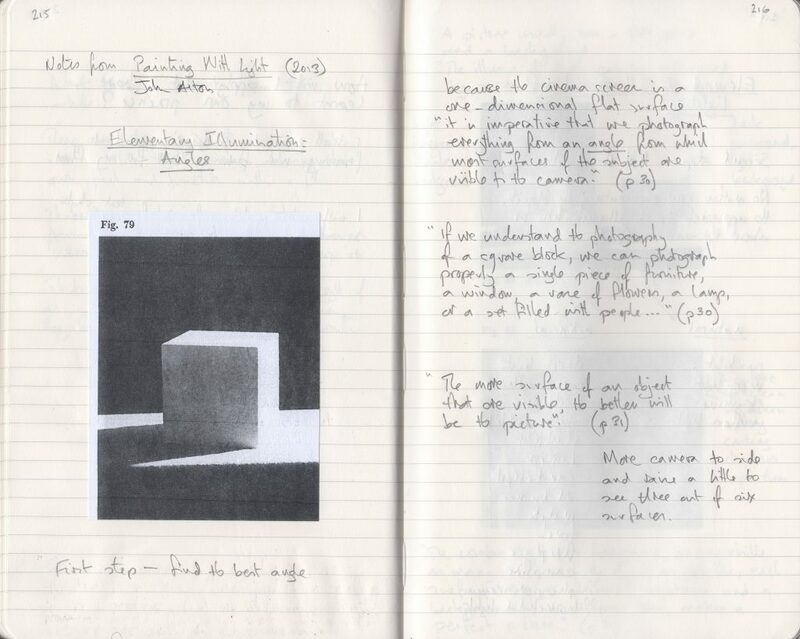 John Alton expands upon the idea to create depth and separation when shooting in black-and-white in his book Painting With Light (2013). Alton’s definition of the perfect black and white picture as a combination of a foreground in which each surface has a different brightness and a background of a different tone is helpful. Alton, J. (2013) Writing With Light. Berkeley: University of California. 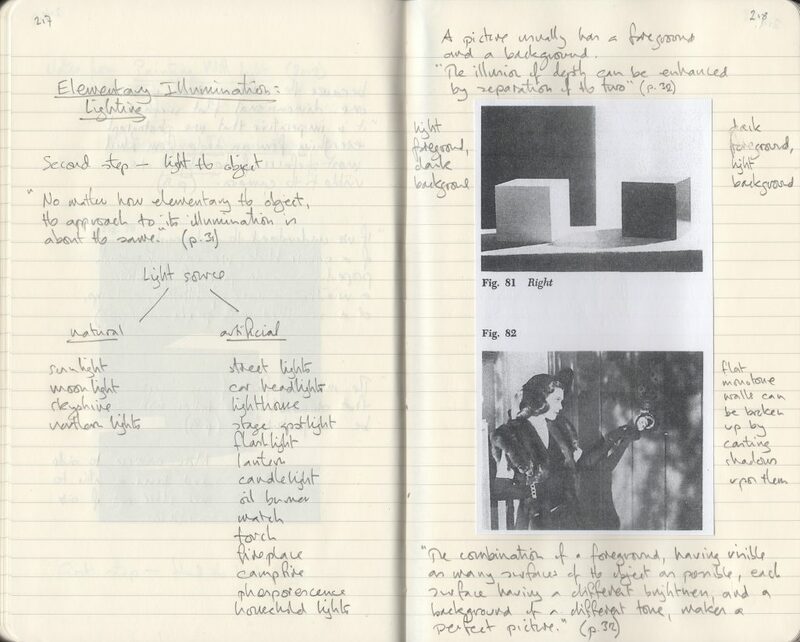 Schaefer & Salvato (2013) Masters of Light: Conversations with Cinematographers. Berkeley: University of California. SLog3 captures footage at the camera’s full 14 stop dynamic range. Capturing footage in SLog3 will allow me to convert the clips into black & white at the post-production stage using LUTs designed specifically for this process. The camera settings noted above are fairly standard for shooting in SLog3. My rationale for selecting this base setting and format/codec combination is that it will help me to achieve the best possible image quality with the FS7 camera. Although it’s not something with which I am very familiar with, I like the idea of using SLog3 because it provides me with more options in post-production when it comes to colour grading. 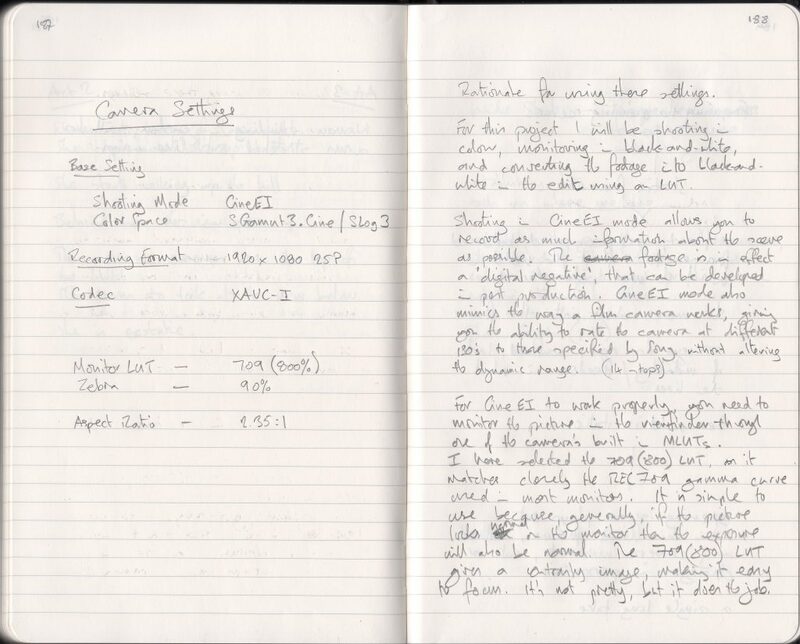 Particularly when it comes to editing the film, as I will be using a LUT to help me produce the black and white image. 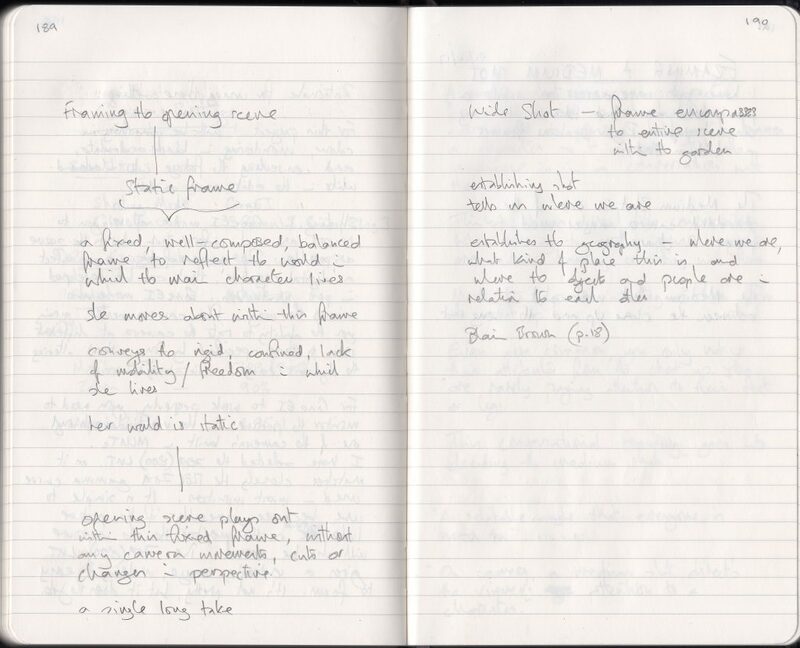 Act 1 – The protagonist is in the garden weeding plants. She straightens up. We hear bird song. On hearing the bird song, the she looks up, sees a bird perched on the chair and tries to follow it. Act 2 – The protagonist arrives at the bottom of a hill. She starts walking up the hill. As she approaches the top of the hill, we see her view over the landscape below. She turns to look at the view and is ecstatic. Act 3 – The protagonist is in the garden, her arms spread out like wings. There is a clear beginning, middle and end, together with an inciting moment (the bird) and a climax (the protagonist ecstatic). I am keen to shape the viewer’s experience of the film. In particular, to finding an effective way to draw the viewer into the film during the opening the scene. Bordwell & Thompson (2017) suggest this is achieved through the ‘manipulation of time, space and pictorial qualities’ (Film Art, p.217).